The Melbourne Radio Control Circuit racers club, was founded in 1989 and originally raced at Geelong, about 2 hours from our present location. 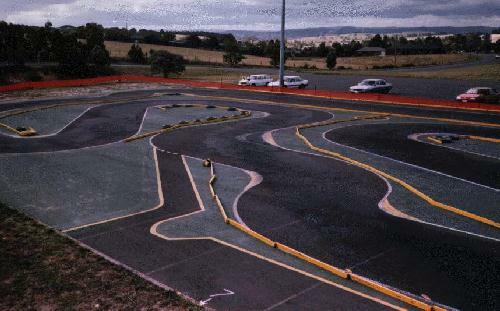 Eventually a track was found closer to home at Chirnside Park in the car park of the local shopping centre. The first race days consisted of driving around in circles using the back of a tip truck as a drivers stand. The track needed to be temporary as the area was still an active car park , although due to some poor planning by the shopping centre developers the area we used was some 500m or more from the shopping centre so the only use it got was as a learner driver course or car park for trucks and buses. This was good for the club as it meant that members could almost always practice at any time. 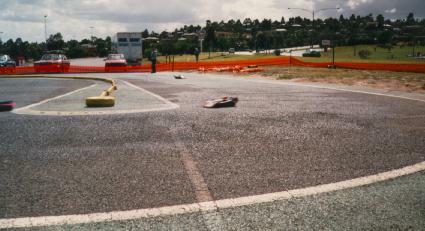 Early attempts at creating a temporary track included gravel filled fire hose, which lasted until the first car hit it, then spread small stones all over the track. Finally the infamous "boards" were used, and remained until the club moved in August 1997. These boards were hated by all as they were time consuming to setup and not very forgiving when a car came off line. Later improvements included, line marking and painting of the "grass" area and a permanent drivers stand. Our club has held a number of Championship events, the 1991 Australian National Championships, we held the 1997 National Championships and most Victorian State Championships since the club's inception. 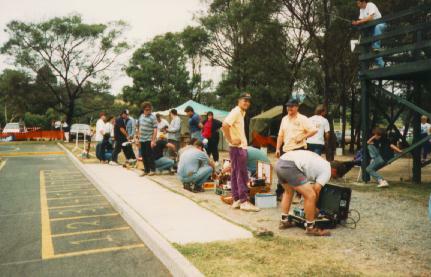 We have been a big supporter of the 1/10th scale class and held the very first Championship event for 1/10th scale, the 1993 Victorian State Championship and we held the first 1/5th scale National Championship in November 1997. 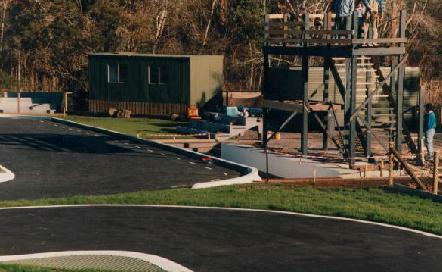 In 1994 we held a 5hour 1/10th scale endurance race which was a great success. Teams of 4 raced the one car for the entire period and after 5 hours the 1st and 2nd places were separated by only one lap. Our club has always been active in the community, seeing the opportunity to promote the sport and the club we put on many demonstration races at local fairs and festivals. These were very time consuming and proved to be of little benefit so in 1995 we shifted our focus to full scale motorsport events. We have put on displays at several Touring car events and the 1996 Australian F1 Grand Prix. In 1993 we first heard that developers planned to develop "our" car park. The track surface was quickly deteriorating and dust from nearby housing developments meant that on all but race days, when we prepared the track surface, the track was almost unusable. So we decided to take the initiative and began to look for a location for a new track. Fortunately for us the developers plans were constantly delayed as it took us until 1995 to find a possible site and we began negotiations with the local shire. 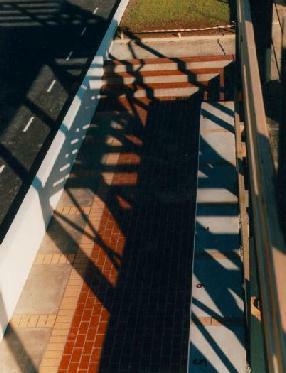 In 1997 we completed construction of our new track. It has been a long drawn out procedure but we believe that we now have a track that we can truly be proud of. 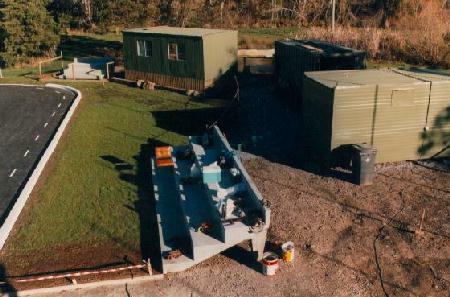 The 5 months of construction were just the final stage of a process which began in 1993 when we started looking for a site for the trackand ended in 1997 with what we now have today. Below are some pictures and a description of the almost completed track, there have since been some additions. 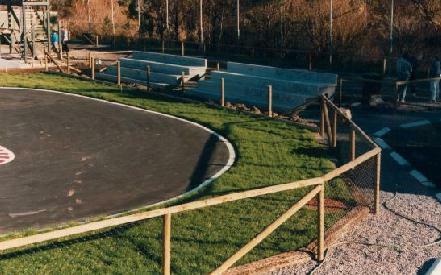 Our track is a purpose built, permanent track featuring an asphalt racing surface, grass infield, concrete ripple strips and curbs as well as a "Toluca" style sunken pit area. The total track length is 280m including the 65m back straight. Most corners have been cambered to help cornering, but perhaps more importantly, to help direct water to one of the several drains that run underneath the track. Spectators have not been forgotten , a walkway around the track gives spectators access to one of the concrete grandstand seats located around the track. They can also walk past the pit area, allowing them to view the action in the pits and talk to drivers, while still providing a secure area for the drivers and their equipment. Some effort has gone in to making this an attractive as well as functional track, landscaping and garden beds around the track perimeter help to beautify the area. We have separate sheds for storage, timing/radio impound and a canteen to provide refreshments to both drivers and spectators. The grandstand in the middle of this picture is for competitors only, while the seating next to the radio impound is for spectators. This is accessed by the walkway which passes behind the paddock area to the right of this picture. The paddock, the gravel area behind the competitors seating, has been sealed using patterned concrete as used in the sunken pit lane. Eventually this area will be totally covered providing competitors with protection from the elements . The drivers stand is 3.6m high, giving drivers an excellent view of the whole track and eliminating any blind spots. The drivers stand is positioned in the centre of the track and directly above the sunken pit lane. A platform positioned halfway up the drivers stand provides an ideal position for a race referee to view the proceedings. The sunken pit lane was inspired by that of the Toluca club in Mexico, where the 1997 World Championships were held. The car enters the pit lane following the dotted line, as the pit area is below the level of the track the pit crew do not need to bend down to pick up the car. This will make refuelling quicker and easier. Stairs at both ends of the pit allow easy access from the paddock area and the numbered boxes to the right of the picture allow the pit crew to work on a car without leaving pit lane. The ripple strips and curbs was an area of some concern. The aim was to create a section of track that would unsettle the car without launching or damaging it. If a driver goes off line or tries to cut a corner he should only lose time, not damage his or someone else’s car. The ripple strips also form the bulk of the apex of the corners so as to reduce the amount of dirt and grass thrown onto the track when someone does come off. As space is limited and we wanted to use as much area as possible for the racing surface, parking is not allowed within the track. Competitors can drive into the track to unload equipment onto tables at the entrance of the paddock, then park in the car park which is located directly opposite the track, only a short walk away.